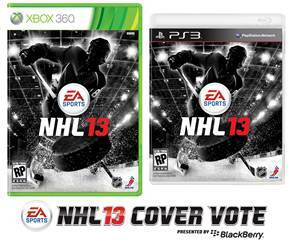 NHL 13 now has a cover vote in much the same way that it's NFL cousin, Madden, as enjoyed for a while now. From now until June, fans can log onto NHL.com/covervote and log their pick for the cover athlete for the 2013 edition of EA's NHL franchise. Sponsored by Blackberry and hosted by the NHL itself, the vote consists of a pair of preliminary rounds (that'll pit teammates against one another) followed by a 16 player bracket. All that'll whittle a full field of 60 players down to a sole man who'll get the nod as the cover boy. The first round of voting ends on the first day of the Stanley Cup finals- that's April 11th for those not 'in the know'. So the point is, you might want to make with the clicking.